Preparing for the future requires two things: immersive insight into historical trends, and the ability to quickly adapt to the fast-evolving digital landscape – without which, organizations will increasingly find it difficult to meet their business challenges or generate new revenue streams. As a technology-driven organization, we know that digital transformation can only occur when the business is as agile and effective as the technology driving it. Converting existing data into predictive insights, we foresee likely mission-critical outcomes and help you take steps to maximize positive results while minimizing negative ones. 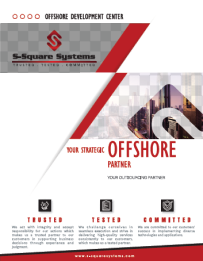 Forecast business outcomes with unmatched accuracy. Identify indicators of fraudulent activity within and between data sets. Accelerate development time on models and facilitate speedy deployments. Gain business-defining insights on-the-move and at breakneck speeds. Catapult the potential of data science to where it belongs whilst driving improved ROI. Amplify the power of predictive analytics. Know what social media can do to grow your business. Get the real-time pulse of your customers exactly where they are. Gain full-spectrum visibility into a specific market and compare results with multivariate data sources. Derive key insights from different perspectives of the same information. Drill-down social sentiment to individual posts by extracting meaningful snippets of online conversations. Bring structure to customers and unlock real value from it. Select ideal fit social media sites that best serve your purposes. Identify specific problems to make sure the end result is actionable information. Gain insights into the actual behavior of consumers regardless of platforms, applications or channels. Turn normal users to power users through white-glove engagement. Explore and influence customer sentiment as it relates to your brand. Know what it takes to turn skeptical customers into actual customers and eventually, repeat customers. Eliminate the gap between raw insights and revenue-generating engagement. Understand how cloud analytics is the best analytics for your business. Make the most of all the elements of cloud-driven analytics. Unlock the collective power of your data sources to inform critical decisions. Support disparate data using cost-effective and scalable solutions. 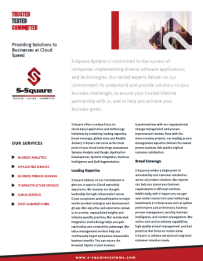 Enable secured connectivity across cloud and on-premise data sources. Speed up the journey towards data-driven agility and digital transformation. Harness the power of data on the internet. Minimize maintenance costs, avoid equipment failures and improve business operations. Blend machine and sensor data with enterprise applications, data warehouses, maintenance history, GPS devices, and more. Effortlessly manage data complexity and volume to ensure failure-proof implementation of analytics. Trace meaningful patterns with compelling visualizations and strategic analysis. Apply equipment-driven insights to drive better operational efficiency. Discover subtle patterns in device data using powerful data mining and machine learning mining tools. Leap from idea to implementation in a matter of clicks. Predict and change future events before they happen. Build insight engines that provide advanced and customer-centric data points. Speedily deploy data-driven and communication-driven engines to manage big data better than competition. 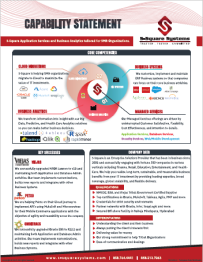 track millions of metrics across applications to define normal customer behavior. Deliver instant analysis of root cause and make intelligent recommendations for current or past incidents. Drive optimal business outcomes by implementing best-in-class algorithms that consider contextual and sudden behavioral changes. Create a 360 degree, single customer view. Grow the size of your business by enhancing customer loyalty and retention. Get 100% visibility over customer activity to predict and tackle fraudulent behavior. Reduce risk and uncover hidden opportunities like Upselling and Cross-selling. Dismantle silos and supercharge data quality. Minimize risks, maximize opportunities and identify trends to grow your business. Comprehensive view of business-specific aspects with visually delightful exploration, self-service access and user-friendly dashboard capabilities. Agile and self-service access to reliable data. A modular approach to drive decision making customer experience and compliance. Acquire data quickly – be it on-premises, on the cloud, or from third-party. Transform master data using external data providers. Identify trends and relationships within data. Extensive connectors for indexing and scanning metadata. Discovery of data domain and relationship. Maximize business outcomes for data-powered enterprises. Optimize business value of information assets via data governance and data analytics. Complete visibility of rules, objects transformation and reference data. Deliver clean, high-quality and trusted data regardless of format, technology, platform and size of data. Optimize business value by fueling all critical initiatives with relevant, trustworthy and lightning fast data. Minimize resource wastage and drive down costs. Identify, monitor and resolve data quality problems on cloud and on-premise applications. Build trust among your customers with enriched and secure email, address and phone data. Capitalize on data and gain detailed access to data points using cutting-edge data analysis techniques. Visually understand business needs through innovative design approaches to facilitate better decisions. Convert business information requirements into extractable and flexible data structures. Analyze and model data, KPIs, metrics, testing and documentation. Holistically manage your data to reduce risks and costs, stay compliant and expand your business. Exceed bottom-line objectives, improve business efficiencies, lower costs and simplify mergers and acquisitions. Decode fault-proof ways to use data as an asset to retain competitive advantage. Govern data policies, processes and standards on a single platform. Drive product innovation across the platform. Achieve digital transformation through an unmatched suite of security solutions. Protect user data, applications and infrastructure. Safeguard and amplify the potential of your full-spectrum value chain. Enable data security intelligence to sensitive data vulnerabilities. Upscale privacy controls to prevent disclosure of and unlawful access to confidential and private information. Automated and secure provisioning of non-production datasets. Ensure repeatable and sustainable data integration best practices. Break down silos and drive enterprise-uniformity of data collection and dissemination. Lower data latency by responding faster to both threats and opportunities. Bridge the gap between warehouse and real-time information. Provide users with timely information on what is happening now and what will happen next. Lots of data, but no real information. Sounds familiar? 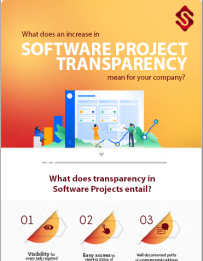 In an era where information overload is increasingly becoming the norm, many organizations make do with inadequate tools because they’re unsure about how exactly business intelligence solutions can deliver value. As a result, they are unable to analyze the hidden potential of unstructured data to drive effective decisions. Just as every keystroke leaves a digital footprint on a stockpile of data, the key lies in understanding the difference between information and data, because information is data which is converted into a meaningful context, ready to harvest insights. 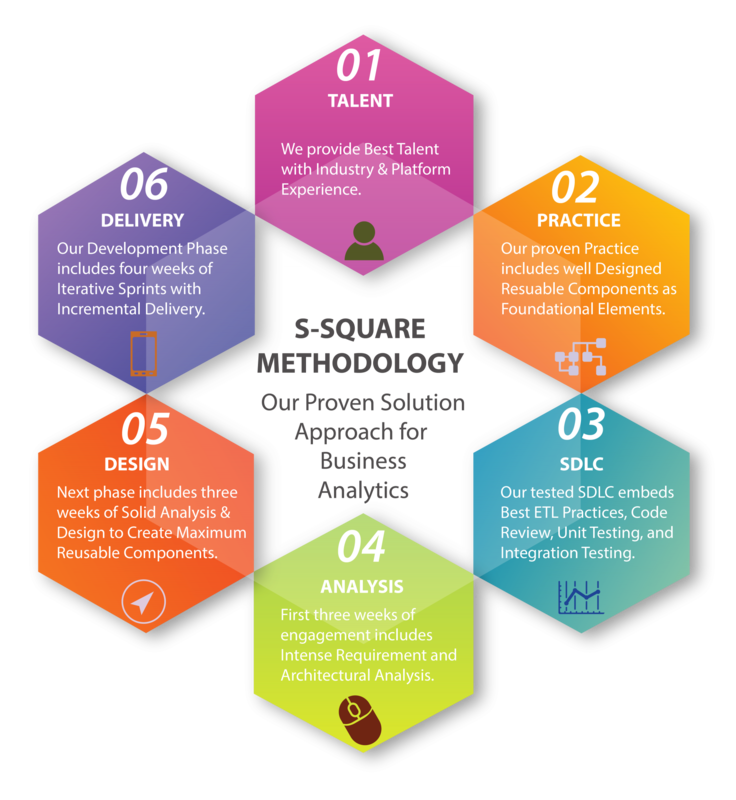 As experts in BI maneuvering, S-Square Systems is committed to helping you discover perfect and fail-proof ways of delivering tangible business benefits. Our unmatched repository of BI solutions takes away the complexities of critical business metrics, eliminates waste and accelerates strategic decision-making. Apart from defining your business goals and helping you accomplish them, we reduce client challenges and add meaning to customer satisfaction – driven by our ability to maximize ROI on your BI initiatives. In a nutshell, we don’t let the data quandary stand between you and your business objectives. Focus on exactly the measurements that matter to your business. Gain 360-degree visibility into every aspect of your business process. Identify the best KPIs to determine your organization’s progress. Know visually-compelling real-time tactical changes. Drill-down deep to the bottom-level information and stay on top of your business goals. Determine the probability of success and failure of your business in no uncertain terms. Validate the accuracy and veracity of your current BI solution. Develop contingency plans by identifying strengths, weaknesses, possibilities and roadblocks. Identify business opportunities before launching a project. Scale up our chances of driving long-term ROI and Bottom-line. Define and implement clear “how-to” paths towards improving all aspects of BI strategy. Pinpoint the key pain-points to prioritize your goals. Know how to get to where you want to from where you currently are – through conceptual planning. 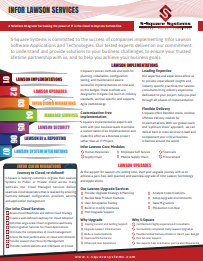 Outline the project’s Lifecycle for decision-driven applications. Ensure data viability, data reliability and data completeness. Track the increase in BI maturity and productivity to drive better decisions. Select the right tool for the right process. Save costs by updating redundant technologies. Gather and prioritize BI requirements. Determine how to identify and factor in additional costs into product comparisons. Ensure speed, scalability and ease of analytical use. Go from reactive to proactive by leveraging real-time, data-driven insights. Perform regular and incisive health check-ups of your business systems. Adopt a holistic approach to performance tuning. Identify the quickest and most efficient methods to optimize your BI environment. Accelerate business growth and deliver better outcomes. Optimize technology to minimize waste and drive revenues.